I’m 37 and never stretched before. Is it too late to start?! There’s hope! Here are some tips for getting started. We hear this question a lot! No matter what the age, people write to us asking if there’s hope for them. Some people are in their 20’s, some people are over 60, and others are in their 30’s, 40’s and up! We’ve got good news for all of you. Improvements in flexibility can happen at any age. Here’s the deal. Flexibility naturally decreases as you age. Some studies have even shown that flexibility can decrease up to 50% in some joint areas. But there’s no need to despair! Studies also strongly support the benefits of regular stretching and mobility training in order to improve flexibility and minimize any loss of range of motion—at any age. It’s never too late to start making improvements in your flexibility. And the sooner you start, the sooner you’ll see progress! So how can you see your progress once you start? Our favorite way is to take photos. On Day 1, take a photo after your stretching session. This first photo will remind you several months down the road where you’ve started. Everyone’s journey is individual and you’ll make progress on your own time, so try not to compare yourself to others. Especially on social media! Your journey will look differently than someone else’s highlight reel. It’s rare that you see exactly what goes on behind the scenes: the weeks, months, and years of consistent stretching that now looks effortless in a beautiful Instagram photo. Be kind and honest with yourself as to where you’re at and where you started. Celebrate your successes along the way! Can you finally touch your toes? That’s great! Snap a photo and challenge your friends to join you in a class. You never know who you’ll inspire by being real with where you’re starting, what your goals are, and the challenges that you feel you’re facing. Do you find yourself saying that you’re just “not flexible”? Well even though you might use that line, do you think that there’s a chance, deep down, that if you spent more time stretching, it’s possible to make some progress toward your goals? Imagine how you would feel if your flexibility improved. Remember: you have the power to control your narrative about what your body is or isn’t. Instead of telling yourself you’re ‘not flexible,’ you can tell yourself that you’re committed to getting more flexible. Reflect on your higher self and the person that you want to be. This positive mindset is a great starting point to dive into your first training session. Now that you have a positive mindset about your ability to get more flexible, it’s time to start! 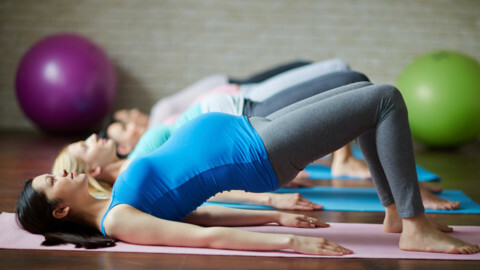 If you’ve never tried a stretching, flexibility, or yoga class before, we recommend getting started with Full Body or Extra Active Stretch beginner classes. There are different options in both packages for 15-minute classes, 30-minute classes, or 45-minute classes. Want to test the waters? Give a 15-minute class a try! Once you’re feeling confident, dive in with a 30- or 45-minute class. We recommend finding yourself a mat that you really like and having a couple of yoga blocks on hand for extra support if you need them. Set yourself up for success by stretching in a comfortable, relaxing environment. Our biggest tip when you’re first starting to stretch is to ease yourself into each stretch, breathing deeply to calm the nervous system, and not pushing too hard or jerking while in the stretch. If the stretch is dynamic, be mindful of the force you’re using. Think: strong but not forceful. Stretching should be uncomfortable at the end range of your motion, but not painful. Direct your breath towards the sensations in your body. If you experience dull discomfort, you’re likely doing it right! If there’s a sharp, burning pain, that’s your body telling you to back off and go a little easier. If you have an injury or structural issue, it’s always smart to talk to your doctor, physical therapist, or other supportive health care professional to get advice on any positions you may want to avoid or be extra careful when attempting.